Sony SAB Tv is soon Launching a New Game Show named "Sabka Spana Money Money" which is going to be starting from April,26,2015.This new SAB Tv Game show is Produced by Anirban Bhattacharya of Rowdy Rascals Production House. Rowdy Rascals Productions is famous for their work in the show Ishq Kills and Sawdhan India.This new Game show is directed by Aditya Vikram. Sabka Sapna Money Money is a Reality Game Show of SAB Tv.This show is based on International Game Show "Who Dares to Win". In this new Show one have to perform different tasks to win money/prizes. Popular MTV Star Gurpreet Saini will be seen as the Host of this new Game show of SAB Tv. 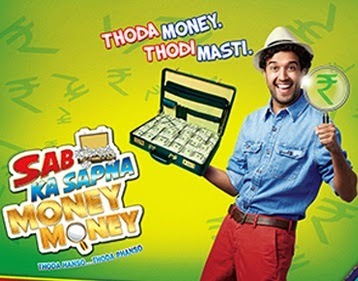 Promo of the Show Sabka Sapna Money Money is already running on SAB Tv. After watching the Promo of the Show i can assure you . You will enjoy this show a-lot. We will Update promo of the Show soon. Show is Launching on 26th,April,2015 on SAB Tv. The Show will be aired on weekends. You can watch this show on Sunday at 12:00 Pm. Repeat Telecast of the show at 07:00pm. Thank for details. Can not wait anymore to watch this show. Super excited ! !